Seattle, WA, February 16, 2018 --(PR.com)-- SMARTR Solutions, LLC has launched the SMARTRealty ICO and announced their plans to bring smart contract technology to common real estate rental and sales transactions. “SMARTRealty is revolutionizing the real estate industry by applying smart contract technology to common real estate transactions such as rental agreements, property sales, and more,” said Ernie Wong, one of the co-founders of SMARTR Solutions. “SMARTRealty is building a smart contract template and management system for use with all common types of real estate transactions, as well as real estate rental and property sales platforms that interact with all the major real estate listing services on the web,” he added. SMARTRealty has three primary elements, the first one is the SMARTRealty contract platform that consists of a template system that allows contract creators to create their own SMARTRealty smart contract that fits the needs of their specific transaction and complies with local statutes for their jurisdiction. The second element is the SMARTRealty listing platforms that will allow the property owners to list their properties for rent or for sale. It will also distribute these listings to several other popular real estate and rental sites across the web. The third element is the RLTY tokens which can be used for SMARTRealty smart contracts. The users will be able to pay with any major currency but it’ll be automatically converted to RLTY tokens for the payments to be properly recorded and tracked. The ICO price of the RLTY token is equal to 0.0008 ETH and ICO participants can buy RLTY with BTC, ETH, BCH, LTC, ETC, and ADA. In addition, SMARTRealty is offering 40% bonus for the first two weeks of the ICO period. SMARTRealty smart contracts can be utilized in many ways such as the purchase and sale of a piece of property or a simple one-year rental agreement. The parties can use the SMARTRealty platform to build their own smart contract, with unique terms such as dates of payment, length of the agreement, penalties for non-compliance etc. 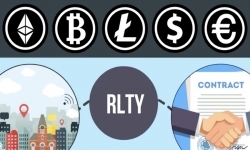 The paying parties can use ETH, BTC, LTC, USD, EUR and other popular currencies that would automatically get converted to RLTY tokens. They can directly pay with RLTY tokens as well, if preferred. One of the major advantages of doing real estate transactions through SMARTRealty is that it enables the users to securely and efficiently solidify the terms of their agreement and track payments. It also reduces the risk of theft and fraud. In short, it provides a faster, reliable and trusted process for renting, buying, and selling of property.